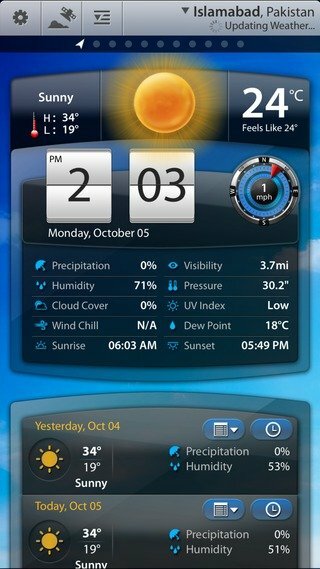 This widget style will have stacked up for you only the most general weather information that one should need. So, if you are someone who does not like a crammed main screen but still would want some of the basic info, this is the widget style to opt for. This widget style tries to jam just about every aspect of weather on a single widget. From the current temperature, wind direction and speed, precipitation and UV index to the future weekly forecast, there seems to be every minute detail juxtaposed on this widget. This option is for the users who do not want any of the widgets to line up their main screens. Hence, their widget-less screens will boast the requisite weather information. Do you want to view detailed weather forecasts? Download our app Weather Mate that allows you to choose from widgeted and text only screen modes.